Home Fiction picture book Some wisdom from the remarkable Patrice Barton — and a giveaway! I’ve been a Patrice Barton fan for as long as I can remember. She draws children as well as (or better) than perhaps any other illustrator. I remember being enchanted by her work in THE INVISIBLE BOY, SWEET MOON BABY and HELLO GOODBYE DOG. 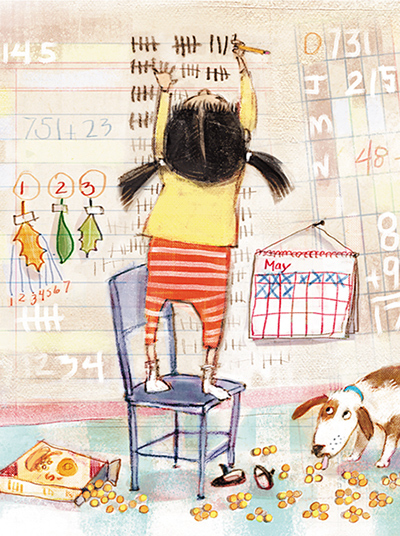 So I might have screamed just a little bit when I found out she’d be illustrating REMARKABLY YOU, my picture book that comes out from HarperCollins in a little more than two weeks. (Want to get a copy right when it comes out Feb. 5? You can pre-order it from a bookstore or online bookseller. Or, ask your local library to order a copy and put it on hold for you.) And, there are details about how you could win a copy at the end of tis post. When I first saw Patrice’s art for the book, I was enthralled. She’d done so much. Each time I flipped through, I saw new details and depth and humor. I had to know how she did it. Fortunately, Patrice agreed to answer some questions about how she put this book together. Let’s start with what it says in tiny type near the start of the book: “The artist used pencil sketches and mixed media, assembled and painted digitally, to create the artwork for this book.” What does that mean? How did you make this lovely art? 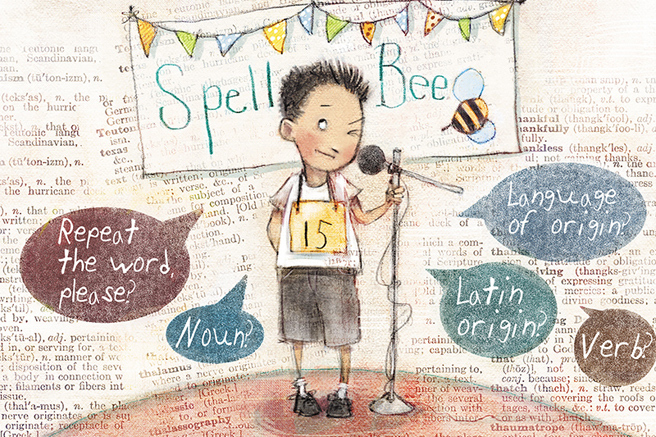 I’ll use the spelling bee art for an example. I scan a pencil sketch into my computer. Also on my computer, I have a file of textures where I keep scanned paper bits, watercolor bits, painted canvas, fabrics like denim, patterns and textures I made in PhotoShop, etc. I select textures and paper bits from this file and add them to my page. For the spelling bee art, I added an endpaper from a 1931 Funk and Wagnall encyclopedia, a page from a dictionary and raw canvas. Next I assemble the textures and pencil sketch in Corel Painter and begin painting. I paint and erase, paint and erase, using my Wacom tablet and Painter’s pencils, pens and brushes until I’m satisfied. And then, there are the end papers. 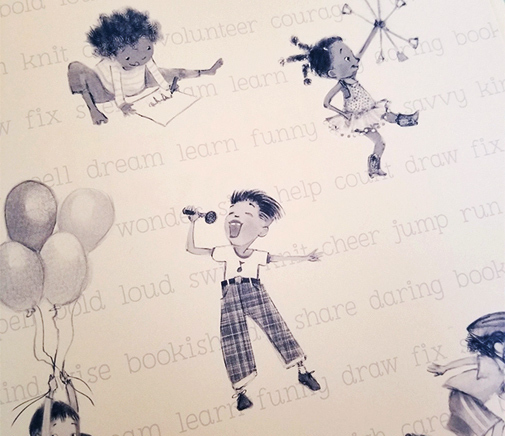 I adore how images of the kids are on top of a running list of words from the book about all the ways you can be remarkable. How did that idea come to be? One of the things I admire about your art are the wonderful kids you draw. Do you spend a lot of time watching real kids to base your art on? Or do the kids come straight from your head? Thank you, Pat! I sketch from my imagination, but I am inspired by memories from my own childhood, from raising my son and by people- watching in general. I sketched a baseball player in this book and then realized he’s my brother, Tony. He and his friends never just walked down the street. They tossed the ball, ran back and forth, and tripped over curbs because they always had their eye on the ball, not where they were walking. I’m also impressed with all the little touches in your artwork — like the world map in the background of some pages, and the cereal puffs counted out in groups of five and the sticky notes spelling out “HA” and “READ.” How do you decide what to add beyond what’s in the text?Once I immerse myself into a character, the details just seem to unfold. The world map in the sky was a fun surprise. For this spread I was inspired by the line, “You could change the world.” My first sketch for this page showed a child with a magnifying glass studying a globe. I realized this made the child seem large and the world small… not what I was looking for. So I took the child outside and put her under a vast sky. That was better. Then I added a telescope, so the child could see the whole world. That triggered adding the world map to the sky. For me, the answers come from doing the work. I’m so glad you noticed the cereal puffs counted out in fives! I really had fun drawing this zealous mathematician. I’m not a numbers person. (Hey, Math, solve your own problems!) But it was fun to pretend. I thought about how high she might count. Maybe so high she would need to stand on a chair! What would she count in her world? Maybe days, maybe leaves she finds on a walk, maybe the cereal she has for a snack. And, oh, the sticky note girl. Love her. Once you get started with sticky notes, it’s hard to stop. Everything MUST be labeled. It’s been my experience that if I start the day with a pad of sticky notes on my desk, by the end of the day, they are everywhere, multiplying like bunnies. Maybe it’s just me. What part of the book did you have the most fun drawing? This whole book was a joy to illustrate. One page I truly enjoyed drawing was “finding invisible dragons to slay.” This really speaks to a child’s vivid imagination. I adore that. 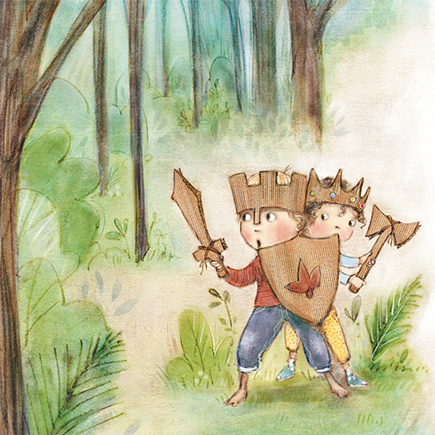 The two friends huddled together on this page are expecting their imaginary dragon to spring out from the woods any second now. Yikes! I wanted to capture that feeling of anticipation, a little fear, a smidgen of courage… just before a breeze makes the trees creak and they both jump, shriek, and run! At least that’s how it plays out for me. I’m sure it’s different for everyone. And that’s what makes it so fun for me! Why do you think this book is important? This timeless book speaks to everyone. Be yourself. Believe in yourself. Share yourself. And — you knew I was going to ask this — what makes YOU remarkable? I am remarkable because I make a mean potato soup. My pot roast is a close second. And do not get me started on my snickerdoodles! Would you like a copy of REMARKABLY YOU? Mailed right to you from me? At no charge? For a chance to win, leave a comment on this post saying why you’re remarkable — because everyone is. And you shouldn’t be ashamed to say why. Fiction, Pat Zietlow Miller, Patrice Barton, rhyming book. Bookmark. Lovely interview and insight into Patrice’s work! Let’s hear it for snickerdoodles! What a lovely book this is and a wonderful interview. Thank you! Wow! I loved hearing about Patrice’s vision for the art and how remarkable she is at executing that. I can’t wait to see every spread – and the endpapers! 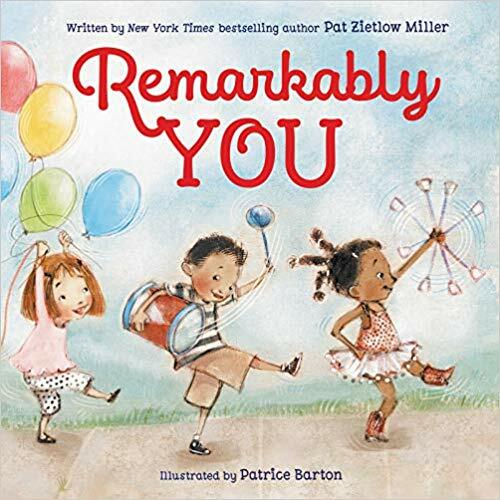 Let’s see, I’m remarkable because I’ve immersed myself into the kidlit field, which is new to me, and get to work alongside amazing people who push my creativity to new levels every day. I loved this interview and all the personal details, like the Y on the little boy’s shirt. What a beautiful tribute to her son. I have to say it’s hard to say what’s remarkable, but I love that you asked it in just this way. My remarkable trait is that I try to remember what’s important to friends and library patrons so that I can recommend books that are just right for them. It’s like being a match maker and the thing I love most about my job. A wonderful interview that makes me want to pour over these lovely illustrations & affirming words. Congratulations to both of you on this new #PB! I’m remarkable for the flowers and veggies I grow on a terrace and the words that blossom on the page. Thanks for sharing this aspect of the book! My remarkableness is along the lines of Patricia’s snickerdoodles…I’ve earned a solid reputation as “the mom who bakes” at my daughter’s elementary school. Let’s just say my scones have turned a few heads:). Love this! I’m remarkable because I have an unstoppable curiosity. And with writing picture books, I finally found a way to share that remarkable trait with others. Thanks! Congrats Pat and Patrice! The book looks absolutely lovely! I can’t wait to study this book–both the words and illustrations. I am remarkable because I see what is going on in the inside of people. it can be dangerous information, and I sometimes get in trouble, but mostly I use it to nudge people towards expressing their gold. A very quiet remarkable. Love the interview. Great insights. I’m remarkable, because I’m an encourager. I do what I say and help others along the way. Illustrating is so fascinating to me. Thank you for this lovely book. Remarkable me = the ability to get inside other people’s feelings. The two “Pats” are a dream team! Can’t wait to read this book! I am remarkably empathetic :). This book looks fabulous, Pat. I’m remarkable because I don’t give up when things get tough. REMARKABLY YOU is a book for everyone! Oh this looks adorable–both the writing and the art. I’m remarkable because of my ability to find joy in the smallest places. Oh my. I can’t wait to get a hold of this book! Thanks for sharing the interview! What a terrific interview! I’m in awe of all the details and ingenious touches Patrice added to her illustrations. So looking forward to reading Remarkably You! I’m remarkable because I see the world in creative ways. Thanks for sharing this interview! I’m remarkable because I can brainstorm some wild and wacky ideas. I love this artwork too. And of course the story is so uplifting. Such an uplifting message – I love it. I’m remarkable because I am creative in more ways than one! Congrats on such a remarkable book! 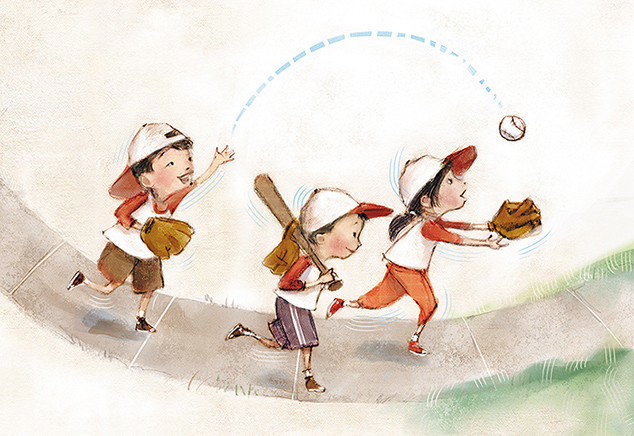 Oh…how I love these illustrations and the whole idea behind this book! Cannot wait to see it! I would like to say that I am remarkable because I love to give gifts to others and I’m pretty good and picking up perfectly suited gifts! Absolutely beautiful. Can’t wait to read this one! Can’t wait to read it! Loving the mixed mediums in the artwork. Great post! I loved this interview! I can’t wait for the book!! Wonderful to hear from Patrice about how her work evolves! “For me, the answers come from doing the work.” Wow! I cannot wait to pore over this beautiful book and admire every word, every detail. I’m remarkable because I never forget a post like this (But, unremarkably can probably never find it again!) Bookmarking…now! I can’t wait for this book to come out AND I am a remarkable musician! Well, I guess I’m remarkable because I LOVE SCHOOL. I’ve graduated from four different universities and taught elementary school for 38 years. Love love love this artwork. And to hear how you do it-icing on the cake! And I’m pretty remarkable because I can be counted on to make flat chocolate chip cookies. Love, love, love! Putting this book on hold. I am remarkable at helping others. This book looks amazing! The illustrations are so, so sweet!!!! I always love to hear the “backstory” of their creation! Great descriptions of both the art and the wording that inspired the drawings. Thank you for the insights. I cannot wait to read and absorb this book. Whenever people ask me if the art turned out the way I imagined for SWEET MOON BABY, I say, “No, it’s 100 times better than anything I could have imagined.” Her vision is flawless. Lucky you. 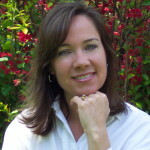 I believe all librarians are remarkable – myself included! I have remarkable parallel parking skills and a remarkable sprinkle drawer (for remarkable cookie decorating!!). I can’t wait to read this one! Fun to hear how the illustrations came about. I am remarkable at making lists and schedules and (mostly) sticking to them. Your book looks wonderful and I have been a fan of Patrice since I discovered her work on the cover of Andrea Cheng’s beautiful chapter books, including “Year of the Book,” “Year of the Baby,” “Year of the Fortune Cookie,” etc. Congrats on your upcoming book birthday! This book looks super-sweet. Congrats on your upcoming Book Birthday. I have been a fan of Patrice Barton’s illustration since I first saw them on the cover of Andrea Cheng’s chapter book series “Year of the Book,” “Year of the Baby,” and Year of the Fortune Cookie,” etc. Thanks for sharing! I love Pat and her books! I’m remarkable because I smile at people and try to be a great friend. I also have remarkable kids who love Pat’s books 🙂 Beautiful illustrations!! 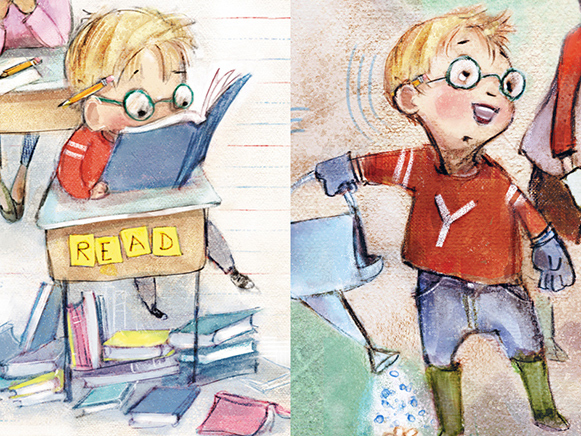 What a fun read into the illustrating process! And who isn’t a post-it person?! They are a wonderful creation. I’m going to say I’m remarkable because I try really hard each day at being the best mom I can be to my 2 wonderful boys (age 4 and 2)! Thanks for the chance to win! I am in awe of Patrice’s work. And in YOUR storytelling ability! I think that I am remarkable because I am a grandma-aged library specialist in an elementary school library who reads kidlit, talks kidlit and LOVES kidlit along with my students. Such a beautiful book! I loved reading about the process of creating art. Perfect captures! I’m remarkable because I love creating and I love my grands enough to chase them around on a regular basis! Thank you for the peek inside the book and illustrations. I love backstories and reasons why. I am Remarkable because I hold on to the fact that we are all Remarkable in so many ways. I cherish and embrace this. This looks like so much fun! I can’t wait to check it out! I loved reading about your artistic process/techniques. I love the little details included in the artwork. Simply beautiful story and illustrations!